I remember watching Jay Hewitt speak at a Children with Diabetes Friends for Life conference several years ago thinking, “Why do people do Ironman triathlons? And also, if you do more than one, have they done Ironmans or Ironmen?” Grammar quandary aside*, Jay is a physical force to be reckoned with and he’s done the whole Ironman journey with diabetes alongside him. I’m proud to call this guy a friend. 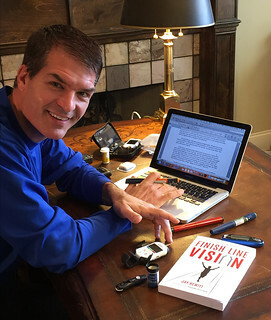 Recently, Jay published his first book, Finish Line Vision, and he’s visiting here on SUM to talk about the writing process, the final product, and what it’s like to cross that finish line. Kerri: For friends who don’t know you, who are you and what is your connection to diabetes? JH: I’ve had type 1 for almost 27 years, diagnosed in February, 1991, when I was 23 years old in my first year of law school. Since then I practiced law for over 20 years, raced Ironman triathlons and three years for the US National Long Distance Triathlon Team in Europe and Australia. Now I’m a husband, dad, speaker, and business consultant on overcoming obstacles and achieving goals. Kerri: You have spent a lot of your time racing professionally as an IronMan triathlete are you still racing? JH: No, after fourteen Ironman and eighteen half Ironman triathlons, dozens of marathons and cycling to win the Race Across America, I was tired! Ha! I achieved everything I wanted to achieve racing. One of the points in my book chapter on work-life balance is “to have the time of your life, make it the right time of our life.” My priority now is racing around after my three young kids, and building my business. But I still keep fit. Kerri: And you’ve also taken on a career as a motivational speaker. What’s that been like? JH: Such a privilege, and a challenge. I love it. It’s a privilege to meet people and hear their stories, their struggles and their dreams. And I can see it in their faces from the stage. I don’t give rah-rah cheers or cheap platitudes. It’s real stories and real emotion and advice that people can use. People deserve substance. They want to know, “How can I use this in my life?” and they want it delivered well. It is a fun challenge to speak to a room of hundreds, sometimes thousands, of people of all different ages, and to people with diabetes and health care professionals and medical companies. Next month I’m the commencement speaker at a college graduation- the last time I wore cap and gown regalia was graduating from law school! Each member of an audience has obstacles and goals that are unique to them. I try to tap into their personal motivation. I also speak to business groups that have no connection to diabetes, but I always weave in diabetes about overcoming obstacles. Kerri: But now you’re an author! Congratulations! What inspired you to put your story to paper? JH: I’d been speaking for years, and people kept asking me for more that I don’t have time to give on stage. More information, more stories – the good and the bad, the real stuff we all struggle with – and solutions and advice. They also wanted to share it with others. People may not remember what I said in a speech, but they will remember how I made them feel. A book is something permanent they can share and refer back to. 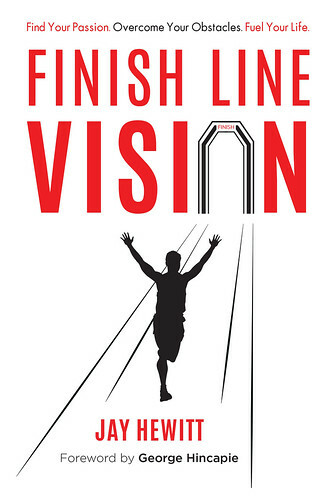 Kerri: Your book, Finish Line Vision, has been a labor of love for the last few years. What does it feel like to have crossed this particular finish line? JH: Like the joy finishing my first Ironman, just not as painful. I don’t do something unless I can give it my best. I knew a book would be permanent. Once it’s in print it is out there and I can’t take it down or update it like an online post. I can’t go to everybody’s house and say “can I have that book back? I need to add something.” Ha! I wanted it accurate and reliable for people to use as a resource, and inspirational regardless of your stage in life. I hope that I have accomplished that. Kerri: What was the process of writing Finish Line Vision like? Kerri: What part of the book is your favorite? JH: The book is funny and emotional, to entertain you and inspire you, and educational to inform you. I tell the irony of the circle of life – the gripping emotion when I was diagnosed with diabetes, the worst day of my life, and how that motivated me to later race Ironman triathlons on the elite level – the best days of my life. When I write about preparation and adjusting – people with diabetes understand that! – there’s a fun story of when I proposed to my wife during a race, and it didn’t go as planned. It got kind of bloody. But it worked! Ha! There are fun stories about elite athletes being scared and nervous, famous people failing and doubting themselves, and great quotes to remember when you feel that way. I guess that’s more than one favorite part! Kerri: How do you want people to feel after they finish reading your book? Kerri: And lastly, where can folks grab a copy of your book? JH: Order from my website www.jayhewitt.com and I will sign it for you! Thanks for stopping by, Jay, and for sharing your finish line vision with us. If you’d like to keep up with Jay, you can order a copy of his book and follow him on Twitter at @JayHewittSpeaks. * It’s Iromans. I checked.